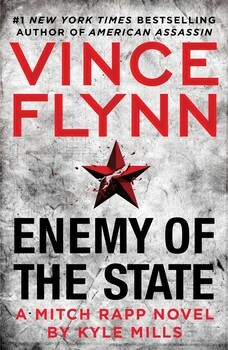 With an explosive plot, incredible action, surprising reappearances from past characters, and Mitch Rapp in top fighting form, Enemy of the State is quite possibly the best book in the series. I’ve enjoyed seeing new facets of Rapp’s personality emerge as his character has continued to evolve under Kyle Mills’ guidance. Once again, Mills has outdone himself and raised the bar higher than ever, I can’t wait to read his next thriller! Enemy of the State can stand on its own, but you really don’t want to miss reading all of Mitch Rapp’s adventures. For the first time in their relationship, the most powerful man in the world wouldn’t meet her eye. #1 New York Times bestselling author Vince Flynn (1966–2013) created one of contemporary fiction’s most popular heroes: CIA counterterrorist agent Mitch Rapp, featured in thirteen of Flynn’s acclaimed political thrillers. All of his novels are New York Times bestsellers, including his stand-alone debut novel, Term Limits. The Mitch Rapp story begins with American Assassin, which will be released as a major film in September 2017. Kyle Mills is the #1 New York Times bestselling author of fifteen political thrillers, including The Survivor for Vince Flynn and The Patriot Attack for Robert Ludlum. He initially found inspiration from his father, the former director of Interpol, and still draws on his contacts in the intelligence community to give his books such realism. Avid outdoor athletes, he and his wife have lived in Jackson Hole, Wyoming, for over twenty years. Visit his website at www.KyleMills.com.